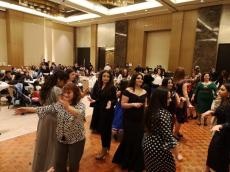 Jewish holiday Purim was celebrated in Baku, Trend reports March 21. The event was attended by the Ambassador of Israel in Azerbaijan Dan Stav, as well as representatives of the embassy. Purim is a Jewish holiday that commemorates the saving of the Jewish people from Haman, who was planning to kill all the Jews. This took place in the ancient Achaemenid Persian Empire. The story is recorded in the Biblical Book of Esther. The holiday begins with “Fast of Esther” during the 13th day of the month of Adar (the 12th month in the Jewish calendar) in memory of the fast imposed by the queen upon herself, on the servants, and on all the Jews of the city of Susa.